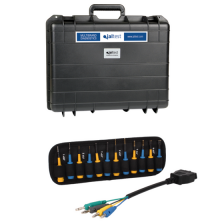 This Jaltest adapter kit is used with the Jaltest Link interface & Jaltest Commercial Vehicle software. Not only does it include the 6 pin, 9 pin & OBD2 connector but it also includes a multi-pin set that allows you to test bulkhead connectors, etc. by inserting test probes without damaging the connectors. We all know that not all problems are solved at the dash connector, sometimes the wire harness needs to be disconnected to isolate the fault. These test probes are just another way to make your technicians more productive.